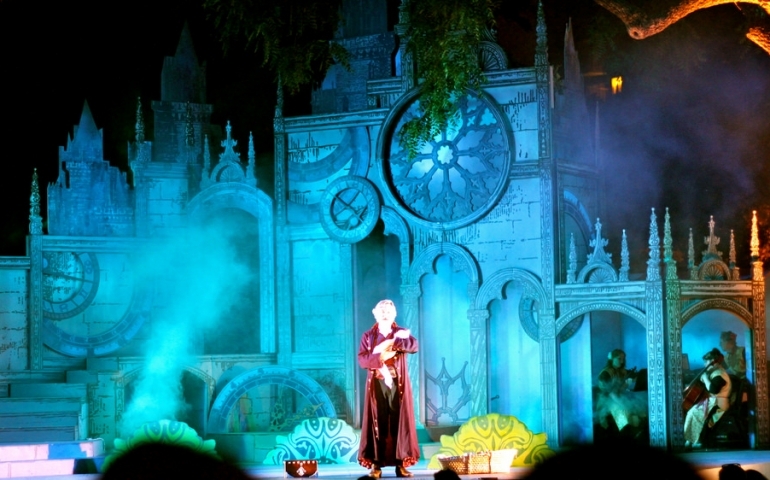 Shakespeare in the Park has been a long-standing summer tradition in many major cities around the country. Throughout each season, several plays are performed. I had the privilege of experiencing the very last performance of Macbeth in Oklahoma City’s 30th season with a few friends on the evening of Sept. 27. Having never read Macbeth in high school, my friends and I were not certain of how the evening would unfold. For those who are not familiar with Macbeth, it is about a nobleman and his wife who rise to the throne through placing their faith in witches’ prophecies. These prophecies lead the Macbeths to deceive and murder, and these actions eventually lead to their insanity and demise. As usual, this Shakespeare play involves a complex plot. Not only were the actors enthusiastic about their respective roles, but they were also skilled at acting. The women who played the role of the witches were particularly convincing as they shrieked, twitched and laughed maniacally to portray mentally deranged people. The actors’ costumes were also tastefully crafted for Shakespeare’s time, but perhaps the best part of the production was the use of the stage. The Myriad Gardens Water Stage is unique for several reasons. First of all, it is circular and surrounded by water. It is also in an open area, preventing actors and the crew from being directly behind the stage while preparing for the next scene because of the possibility of being seen. Sadly, the season doesn’t return until June. However, it is well worth the wait.